Fishing for carp in the winter time can be a tricky matter. When the weather gets cold the fish often change locations and school up. 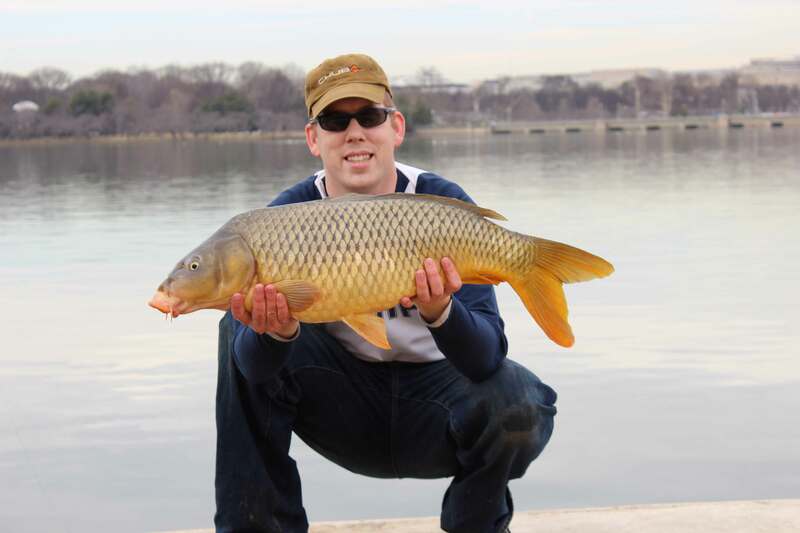 One of the big changes is that carps’ metabolisms slow down and their ability to digest food also is reduced. This means that when winter fishing, you need to chum a whole lot less and you need to use baits that are very easy for carp to digest. A nice 20 lb carp I caught this winter on my best winter stick mix: bread crumb and sweet corn coated in a Nash sweet corn attractant. So, when it gets cold, my go-to bait is a classic winter stick mix containing bread crumb and sweet corn. 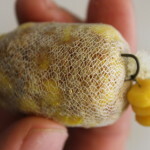 I use sweet corn in the winter because it is easier to digest than deer corn and because there is less problem with nuisance fish stealing the bait. Bread crumb in another easily digested simple carbohydrate. The carp love bread, its easy to digest and it doesn’t fill them up too easily. Because the carp eat less in winter, we use much less chum in the winter. This means that you have to be much more precise with your chumming. A stick mix is a perfect way to chum exactly on top of your hook at extreme distances. Take whole wheat sandwich bread and put it in a blender/liquidizer. Blend it until it creates a light fluffy pile of super fine bread crumb. Once you have the winter stick mix in the pva mesh,use an extra long baiting needle to thread it onto the leader. Next get a can of whole sweet corn kernels. Drain off the water and dump the kernels into a paper towel. Squeeze the kernels in the paper towel and squeeze out as much water as you can without crushing the kernels. Spread out the kernels and pat them down with a dry paper towel and try to get off as much water as possible. Next, put the kernels into a ziplock bag and add your favorite PVA friendly flavor. I like Nash’s Sweet Corn Syrup or Korda Goo Corn Twist. Sunflower oil can also be a good additive. Add just enough flavoring to coat the kernels without any liquid pooling in the bottom of the bag. Too create the ultimate winter stick mix, the next thing you need to do is mix the flavored corn with the bread crumb and mix thoroughly. Then take a modest handful of bread crumb and corn and put it into a PVA funnel web system. Pack it tight with the plunger but do not crush the kernels. The water inside the kernels will melt the PVA so don’t crush the kernels. If done properly, the PVA stick will not dissolve for several hours, but eventually the water from the corn will seep out and destroy the PVA. I like to use an inline lead with my stick mix. Simply thread on the inline lead of your choice, then the protective sleeve, and then a swivel with a quick clip. 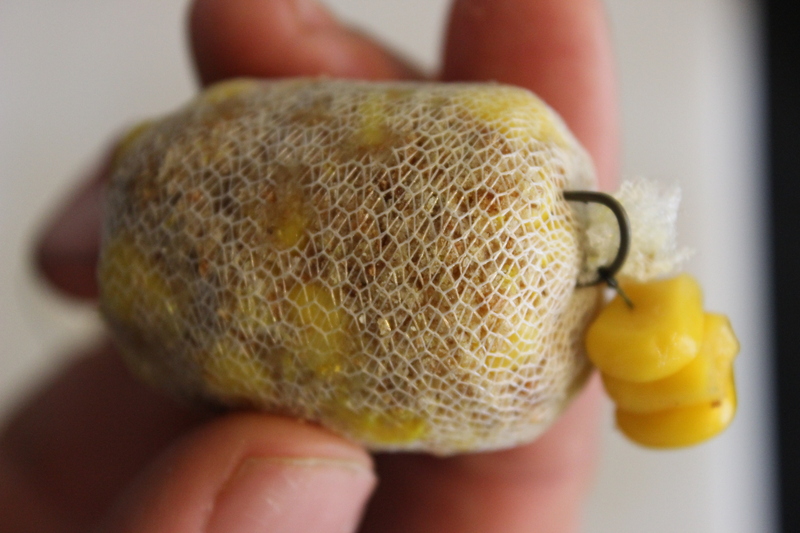 Tie a hair rig with few kernels of corn using the hook of your choice (I like Korda widegap #6). Leave about 8-10″ of leader coming off of your hook and either tie on a micro swivel or just a loop to the end of the leader. My best winter stick mix for carp is bread crumb and sweet corn coated in attractant. 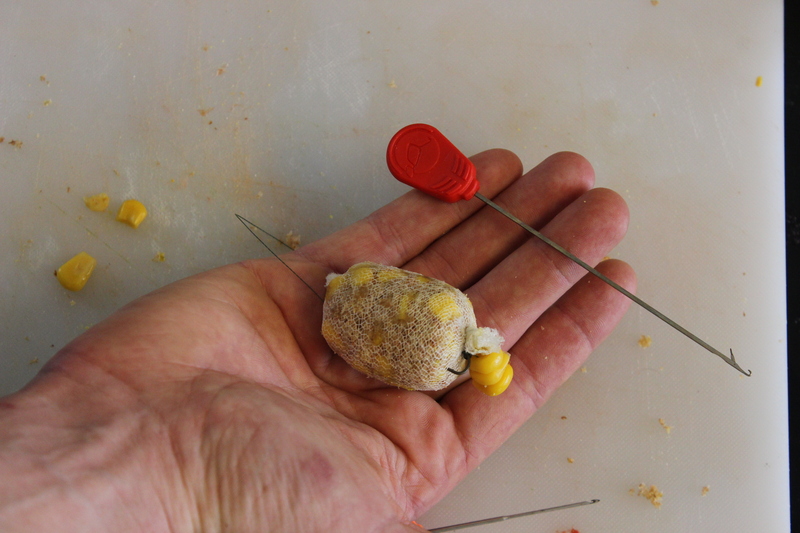 Next, take your PVA stick with the bait inside and push a baiting needle through the middle long-ways. Attach the leaders micro-swivel or loop to the baiting needle and pull it through the PVA stick. Pull the hook into the PVA stick until the point enters the PVA mesh. 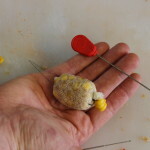 Make sure the hook point is not embedded in a corn kernel. Once the PVA stick mix is threaded on the leader, attach the leader to the mainline with the quick clip and cast. I like to keep a few PVA stick mixes already threaded on a leader waiting and ready while I fish. That way I can just unclip the bait-less leader and attach a rig that is ready to cast so I maximize fishing time.